The new Phobya pumps: A revolution begins! Quiet: At less than 22dB even most fans in the system emit more noise. For decoupling and therefore further noise reduction two kits are included with the pump: The first a map for quick and easy mounting on the case floor. The mat is self-adhesive on both sides and therefore reliably fixates the pump. The second possibility for pump installation are two brackets with which the pump can be fixated in the case. A ceramic-based centrifugal bearing promises quiet operation and a long lifespan. 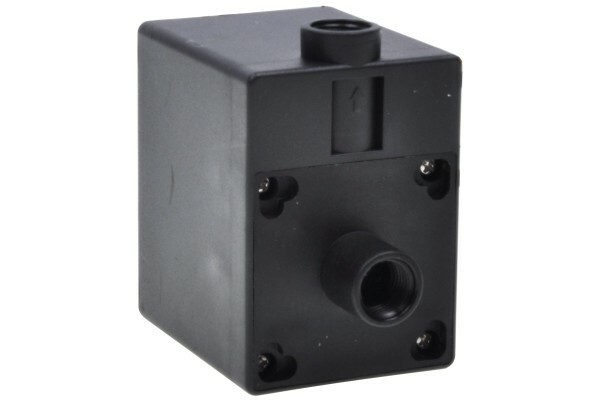 Compact: With the small outer dimensions (see technical specifications) the pump can be installed in almost any corner of the case, even in Midi- or Mini-towers. The compact dimensions of the pump also make connection to the cooling loop easy as the pump's position can easily be varied. Powerful: Such a small and quiet pump so far always required compromises regarding the power. Not anymore! 4m of pressure head and 800l/h of flow are the kind of performance that will not be stopped even by cooling loops even with multiple waterblocks. G1/4" connection: No adaptors, no annoyingly long connectors any more! Simply screw in the desired connector and you are set to go! 12V connector: The first advantage of a 12V connector is that it makes the connection with a 230V cable obsolete and that internal operation is made safe and easy. The other great feature of this pump is the connector: It is not a standard 4-Pin Molex connector, it is a 4-Pin PWM connector. This pump can therefore be operated at a fan connector on a Mainboard or a fan controller. This also allows a speed reduction of the pump: Only 8V are required for starting and operation of the pump which makes it additionally quiet and smooth in operation. The fan connector also offers the advantage of rpm monitoring with a compatible controller. Diese Pumpe wird doch über ein 4 Pin molex Stecker mit Strom versorgt. Jedoch steht in der Beschreibung, dass man beim PWM Anschluss auf die Leistung achten soll des Anschlusses auf dem Board. Mein Anschluss auf dem Board hätte 12 Watt laut Handbuch und 1 Ampere. Kann ich diese Pumpe dann verwenden trotz Leistungsaufnahme von 18 Watt? Oder habe ich Einschränkungen? Das Problem liegt vielmehr daran, dass die Mainboards zwar den PWM Anschluss haben, aber die Ausgangsleistung nicht zwingend auf 12V ausgelegt ist. Sprich da sollten Sie einmal im BIOS die Einstellungen überprüfen. Zudem unterstützen viele Mainboards die Pumpensteuerung nicht, dazu sollten Sie auch mal rechachieren, wie sich ihres dazu verhält. Die Pumpe ist für den Preis wirklich Top, etwas runterregeln dann ist Sie auch angenehm leise.